It might not be the crime of the century, but this sneaky vodka theft caught on CCTV may be the most stomach churning. A Vladivostok shop thief has done the reputation of his countrymen no favors by downing a large bottle of vodka. 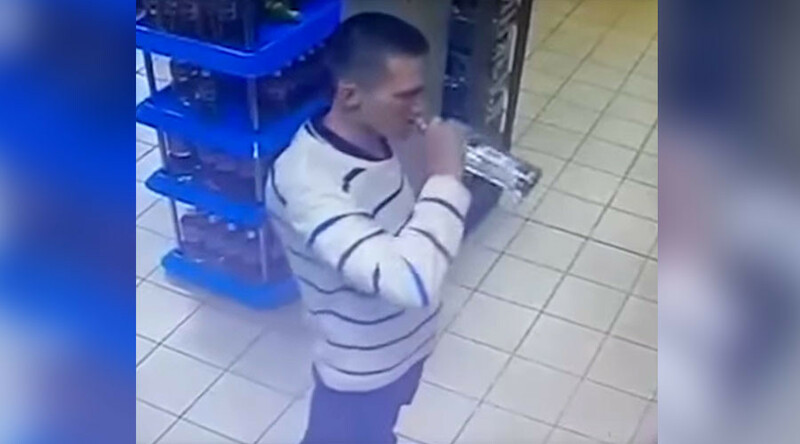 CCTV footage from a store in Russia’s eastern port city shows a man, a little unsteady on his feet, approach a shelf stocked with booze before picking up a 0.7 liter bottle of vodka, removing its cap and chugging away. For more than 25 seconds the man can be seen drinking the vodka straight before having to break for air. He then takes a second quick swig to polish off the high-percentage alcohol. According to Vladivostok News, the 34 year old refused to hand over money for the swiftly-consumed drink - though he did pay for his audacity in another way by requiring medical treatment after leaving the store. The man reportedly tried to claim the bottle was already empty. He has also been known to visit other stores to ‘sample’ alcoholic beverages and has already been fined by police for previous incidents. The fact that the unnamed 34 year old managed to drink that amount of booze in one go and stay standing is hard to fathom. Less impressive, however, are Russia’s statistics on alcohol consumption. According to OECD data, the nation remains one the biggest drinkers out of OECD countries, consuming at least 13.8 liters of alcohol per capita. A 2014 Lancet journal study found that around 25 percent of Russian men die before the age of 55, largely due to their intake of alcohol.